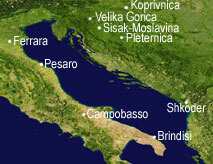 The Project WaterCycle focuses on the exchange of experiences, good practices and pilot actions in the field of planning and managing water resources in catchment’s basins, coastal areas and lagoons on the shores of the Adriatic Sea, with a view to developing new synergies and technical and scientific cross-border partnerships. The valorisation of the surface water network as territorial resource and the identification of innovative “organizational/institutional” instruments and sustainable, effective management forms is extremely important for territorial public institutions and local communities. In line with the EU directives implemented in national and regional law, public bodies will soon be called upon to draw up its own action in water protection. Thus the need for suitable instruments to ensure the correct planning and management of surface waters, given the hydrological, hydraulic and management characteristics of the waters of this area. Therefore, the general objective of this Project is starting a fruitful exchange of knowledge and expertise, carrying out experiments and pilot actions coordinated among the Province of Ferrara and the Provincial Authorities and other institutions of the Italian Regions Marche, Molise and Puglia, as well as the PAO partners working on planning and managing surface waters on the eastern shore of the Adriatic Sea. The project will turn into an important moment of technical and scientific growth for all the Partners involved, whereas public institutions will benefit from the ensuing transfer of professional expertise developed independently but targeted at analogue working areas. - Creating a system for the management of waste water at urban level, which can deal with local intricate environmental situations (the Lake of Shkoder) and meet the needs of urban areas. directory. I used, "Blogger: WaterCycle - Post a Comment" as your site title. it completely, email me at sallapp@bigstring.com.